I want to wish everyone a Merry Christmas and Happy Holidays. I have been so lucky to meet amazing friends running my stamping business and want to thank you for being a part of it. I was trying to think of a fun blog post for you today so I thought I would share a fun tag project I designed a while back. You could easily change the tags to be all occasion tags for a fun gift. 1. Emboss the plastic sleeve from a Tag a Bag box with the Lucky Stars Embossing Folder. Place the embossing folder inside the plastic sleeve, place a piece of tape to hold it in place and emboss one section at a time. Repeat 3 more times until it’s all embossed. Due to its thickness, I didn’t use any tabs on my multipurpose platform. 2. Stamp five “To:, From:” tags with Lost lagoon ink on Whisper White card stock. 3. Stamp five “Good to the Last Bite” tags with Smoky Slate ink. 4. Stamp five “A Very Merry Everything To You and Yours” with Pear Pizzazz ink. 5. 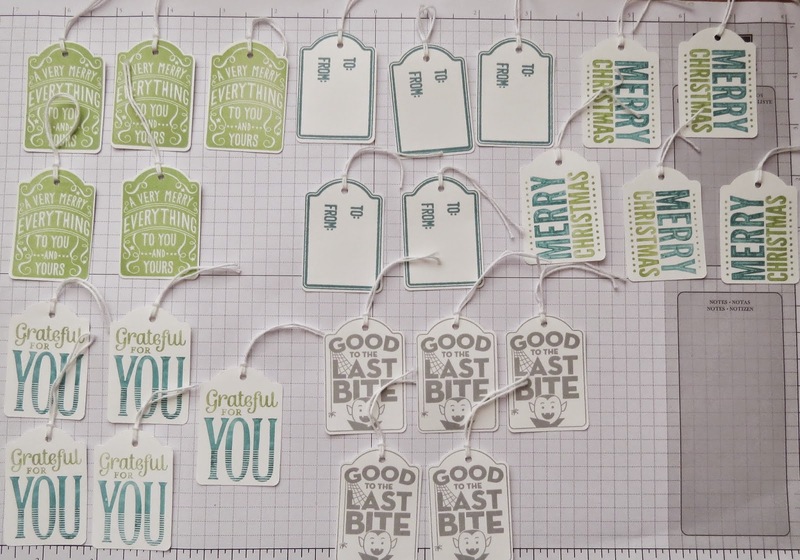 Stamp five “Merry Christmas “ tags with Lost Lagoon and Pear Pizzazz Stampin’ Write markers. 6. Stamp five “Grateful for You” tags with Lost Lagoon and Pear Pizzazz Stampin’ Write markers. 7. 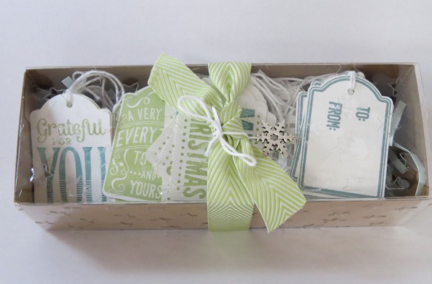 Punch out the tags with a 1/8” handheld Circle Punch and add Whisper White Baker’s Twine to the tags. 8. Cut the 8-1/2” side of Soft Sky card stock in half at 4-1/4”. Use fringe scissors to cut strips of card stock. Crumple the paper strips up and place in the Tag a Bag box. 9. Decorate the box with 16” of ¾” Pear Pizzazz Chevron Ribbon. Add a snowflake embellishment with Whisper White Baker’s Twine.